1. Preheat the oven to 220˚C, gas mark 7. Peel the carrots and cut them into roughly 4cm-long cylinders. Put them in a large roasting tray so there’s space for them to roast rather than stew. Add the oil, toss through the carrots then sprinkle the ginger over the top, shaking the tray to coat the carrots evenly. Roast for 30-45 minutes until tender and blistered, shaking the tray after 25 minutes. 2. Meanwhile, make the crumb by mixing the orange zest, almonds and parsley. 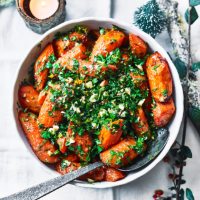 Remove the carrots from the oven, season, then transfer to a serving dish and sprinkle the herby crumb over the top.